It's release day at Hero Arts! Today the products from the 2018 Summer Catalog are launching on the Hero Arts website, and we're celebrating with a fun blog hop! You should have come here by way of the Hero Arts blog - if you didn't, I highly recommend you head back and start at the beginning. Today I'm sharing a favorite card I created for the catalog. 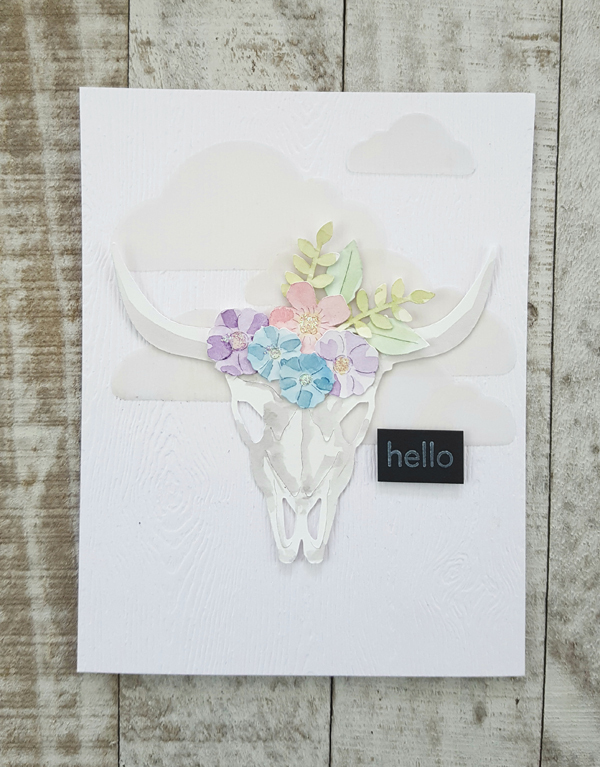 This is a release is a combination of flowers and a western theme. The On The Prairie fancy die combines the two! 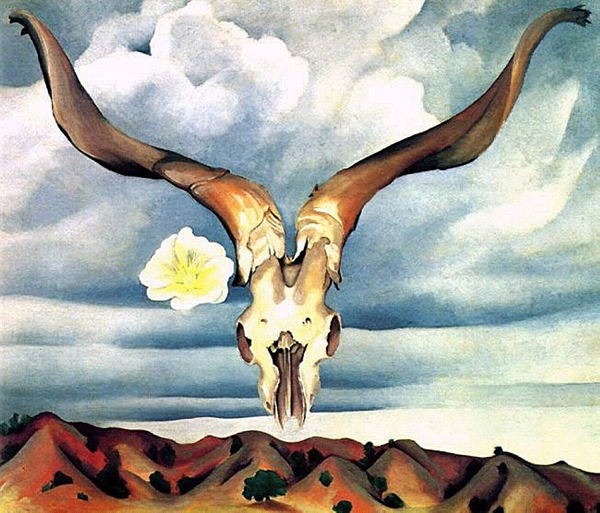 It is inspired by Georgia O'Keeffe, one of the great artists of the American Southwest, and I absolutely love it! I die cut the skull and flowers from Bristol paper, and watercolored them loosely using Liquid Watercolors in Purple, Strawberry, Deep Ocean, Moss and Pine, with some watered down Black on the skull itself. Once they were dry, I also added a big of glitter glue to the centers. For the background, I die cut clouds from Classic Vellum with the Nesting Clouds Infinity Dies, and then mounted it all on a panel of Decorative Woodgrain Cardstock. 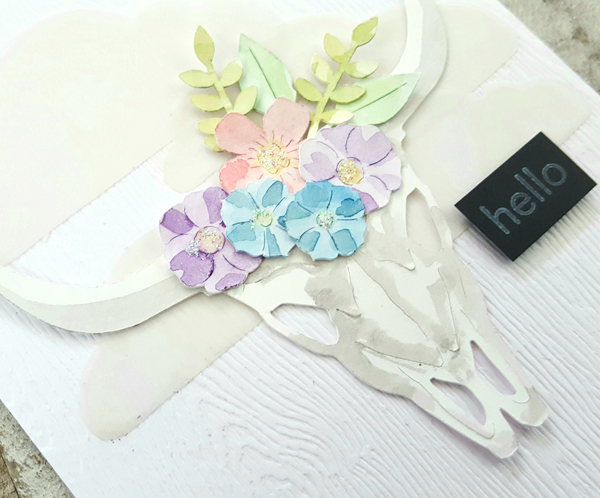 The "hello" message is from the Hero Florals Rose Stamp & Cut, and I stamped it in Unicorn White ink on a small bit of black cardstock, and popped it up. I was inspired by this Georgia O'Keeffe painting when creating this card. What do you think, did I achieve the feel of it? Kinda sorta? Now it's time to hop. 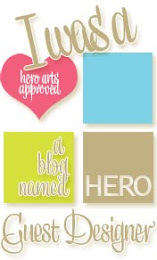 Be sure to visit everyone along the hop and leave comments - Hero Arts will be giving away TWO $50 gift certificates to lucky winners drawn from the blog comments across the hop. You have until Sunday, May 20 at 11:59pm pacific to leave those comments! 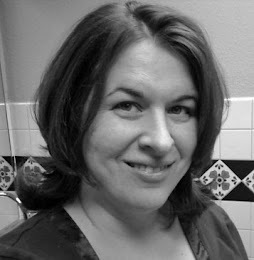 You're almost at the end of the hop - all that's left is the one and only Jennifer McGuire! 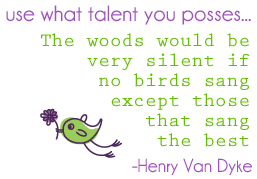 Love your awesome project Libby! Libby! I LOVE this. Totally gorgeous. Your skull card is just gorgeous! You nailed this! What an awesome 'relic'! Amazing! I love the soft flowers! Really like this soft take on this buffalo head! Thank you so much for sharing your inspiration photo - it is so interesting to see how people express each photo! somehow you made a "dead steer" look beautiful! Awesome card! Great take on using the die. I think you definitely achieved the look! I love this softer version! Beautiful card and I love how you colored the flowers, Great job! As a big fan of the One & Only O'Keefe, I think Georgia would be proud! You did a great job. You did a marvelous job. This is beautiful. Loving your addiction...I am too hooked on to papercrafting for long now!! Fab job and thank you for sharing the painting too. Really pretty! It does remind me of a Georgia O'Keeffe! These are fabulous cards. I can't wait to get those dies. Absolutely the coolest! Love the white .... great design! Awesome job! Love me some Georgia O'Keeffe! Oh, Libby... super cool with a feminine touch... love how you dressed that head up... very southern! Can jump right into the wild-west with these cute cards. Thanks for sharing and for the fun. Very unique card. Love the western theme of this release. WOW!!!! That is so creative and you did a fantastic job creating this! Wild wild west art and worthy of framing!! Great work! Kinda', Sorta', for sure! Love this card, Libby!! You did a great job with skull! Oh YES!!! Your design is QUITE reminiscent of the Georgia O'Keeffe painting!! I just love it!! I love the flowers against the woodgrain paper!! These are great. I love the softness of the first one and the coloring on the second is fantastic. Love the painting and yes, I think you did an excellent job with your rendition! Lovely! Love the flowers, love the cards. So creative. Great job achieving the look of the painting. You really brought that skull "to life" with the flowers and coloring. Great job! Wonderful cards. Enjoy seeing two versions of the same stamp. Pretty cards! I really like the flowers that you added to the top of the skull! Very pretty! Love your florals on the skull. Cards were pretty cool too. I just love me anything floral. Thank you for sharing. Super cool card! Love how you added soft elements to add a touch of feminine to this card. So soft and many lauers. A new take on the skull, love it. You did indeed capture the spirit of Georgia O'Keefe's painting. Very nicely done! Pretty card. I love the soft colors you used. Wow! It is hard to make a skull look feminine, but you have mastered it! Very nice! Wonderful cards. Love the awesome scene you created on the second card. Hi Libby, once I saw your card I thought of Georgia O'Keeffe before I even scroll down the post. You've definitely achieved the feel! Well done! And thanks for sharing. The longhorn skull is something I personally probably wouldn’t use. But, you did a great job. More than kinda sorta - you got it!! Beautifully done! I love your unique inspiration, great card. I was thinking it reminded me of Georgia O'keeffe before I even saw it was your inspiration. Beautiful card. I'm not wild about the skull stamp, but I like the way you've used it the best of any I've seen. While your card is totally different than Georgia's painting, I do think you achieved a certain muted moodiness. Well done! You ABSOLUTELY captured a Georgia O'Keeffe feel with your unique and beautiful project. Love your cool, pastel interpretation. That's a resounding YES from me. You totally captured the feel of your inspiration photo. Beautiful card! What a lovely card. I love the subtle clouds and pastel flowers. Thanks for sharing! So pretty! Love all the whites and those sweet flowers! Your first card is so pretty--love the colors and flowers, wouldn't have thought to do that combo! This is the most feminine cow skull I've ever seen. I love all the soft colors you used. I really like your interpretation of Georgia O'Keefe! Thanks for sharing your creativity with us; this is not a design I would have even thought to try for, much less attempt. Now this would be a great card to give to a male or female who appreciates fine art. Thanks for sharing. Great card and loved you showed what your inspiration was from! What a lovely interpretation of the painting! I love your interpretation of the painting. I actually prefer the softer colors you used. It's a beautiful card! Such a great card. I love the soft colours.